In 2017, the total population of East of England region was 6.2M. Since 2002, it increased by 736k people, which makes up for 13.5% population growth. Population average age was 40.9. It increased by 1.6 years since 2002. 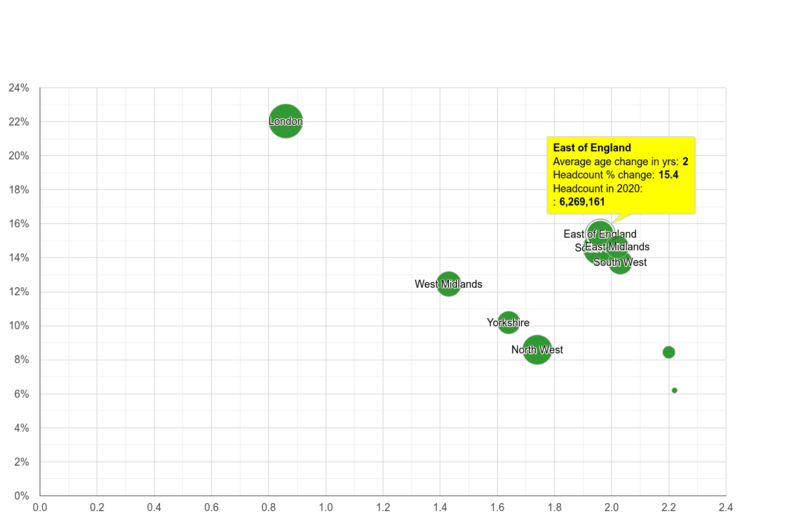 Compares speed of population growth to other regions. Areas with the highest population growth are on the left. Shows relative population change between 2002 and 2017. Compares the speed of average age change in the regions. Areas with the fastest ageing population are on the left, the areas with their population becoming younger are on the right. Compares change between 2002 and 2017. Comparison to other regions. Metrics show a percentage change in the headcount between 2002 and 2017 on y-axis and change of the population's average age on x-axis. The size of the circle is directly proportional to the total population in 2017.